I have an affinity for signs. I love to think about symbols and how they are interpreted; how they’re designed to convey a certain message and the way that message comes to be associated with the image, even for those who may have initially responded differently. As I see these interesting signs I often wish I had a camera with me to snap a shot and post them here so that I could see what other people think. Luckily in Bogotá it’s one of a few possessions that I have and I can easily remember to leave the house each morning with it in my bag. Plus, there’s a lot of new stuff that I wanna capture and possibly relate to you (the reader) later. Also, if anyone happens to be on Briarcliff just north of Ponce and has a camera handy, please get me a shot of the Hungus Amongus sign. It’s a traditional yellow diamond with the silhouette of a man with a cane and a rather disgusting, albeit distinguishing, physical feature. I’m surprised it hasn’t shown up on isawitonponce yet. If you take a picture of it and send it to me you’ll receive a free vargocity t-shirt. For example take this gem I caught outside the front door to my building. At first it looked to me like one of those pictograms from a game show on which they reveal the big picture piece by piece. For example, envision this… 2 – [wasp] – [rowing implement] – [tied rope] – 2 – [wasp]These little puzzles call upon a creative spark equal to that normally reserved for dealing with vanity license plates. 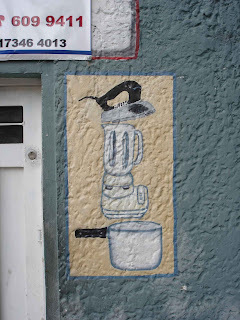 But I doubt this sign is trying to tell someone “iron, blender, pot” This image is far more utilitarian. It’s advertising the services of a small shop run out of the space right next to it. As best I can tell it means they’ll repair small, household electronics. Of course I’m keeping my eyes peeled for more like it and accepting suggestions for alternate interpretations. Although this is not a sign exactly it is one of those funny things I just wanted to share. It looks like Snuggles, the fabric softening bear, but I’m guessing it’s actually his more free spirited cousin. Anyway, at least she’s found work down here sponsoring a line of breads. You can know something for a long time before you finally fully realize what it means. This period of less than complete awareness of a situation is usually described by people who have just won the Super Bowl or have experienced the passing of someone close to them. It usually goes something like, “I’m waiting for it to hit me” or “it hasn’t had time to sink in yet.” Later they find themselves at Disneyworld or they open a drawer to come across an old picture and awareness is heightened. Yesterday I had a moment like this as I embarked for South America. Though I have not formally introduced it in a post, I’ll be in Bogotá for the summer working with researchers and their data to develop my thesis. I knew I was going but it doesn’t always set in that you’ll be in a foreign place until you are confronted with some of the differences. The Avianca plane that carried me from Ft. Lauderdale to Bogotá provided this (see left) subtle hint that there was no tuning back and gave me a deeper understanding of exactly where I was. Ironically it did this by confusing me. I thought I had the sign figured out but I asked someone today why there was a “K” and they had no idea. No worries I had the aisle. One thing that becomes very clear with a fair amount of travel is that the same books keep popping up over and over again. On each of my flights yesterday I was sitting one seat away from a woman reading ‘Wicked.’ Maybe I’m jumping the gun here, but when I was traveling several times a week for work at Akzo, it was the DiVinci Code. That thing was everywhere (they had everybody on that case). Maybe it’s because they only sell certain books in those airport magazine stands. If someone gives you one of those books as a gift, they probably picked it up, last minute, at the airport. In any event I arrived safely, found my accommodations and have since begun my work.